Shin splints, also known as Medial Tibial Stress Syndrome (MTSS), are one of the most common leg and overuse injuries among athletes. According to research, shin splints make up a staggering 60% of all lower leg injuries, out of which 9,5% are runners . The recovery time is varying and may range anywhere from 4 to 18 weeks [1, 2]. As with many other injuries, the risk of reinjury is much higher in individuals with a history of MTSS, compared to those without a history . This is why it’s so important that you provide yourself with optimal support and protection for your shins. In this article, we will discuss the cause of shin splints, how you should treat the injury, and what exercises you can do to prevent future injuries. 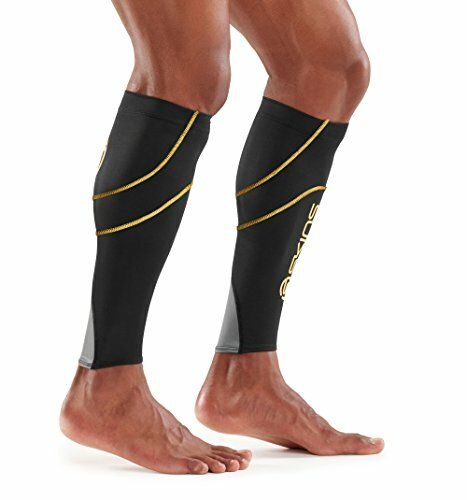 We will also provide you with a list of high-quality shin splint compression sleeves and support braces. 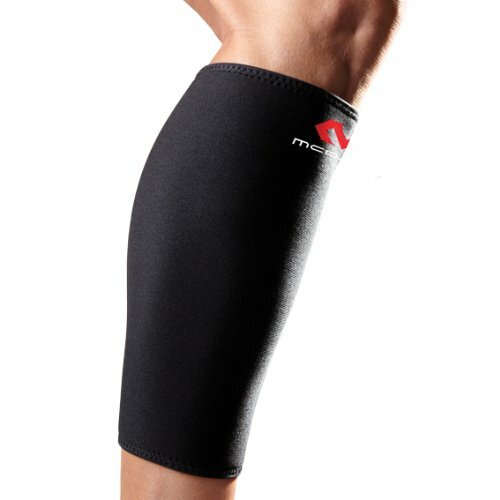 This sleeve from McDavid is specifically designed to reduce pain related to shin splints, calf strains and varicose veins (enlarged and twisted veins). The thermal compression and extra strong seam offer additional support for soft tissue such as tendons, ligaments, and muscles while also aiding you in recovering from injury. As for durability, the sleeve is equipped with solid nylon fabric that makes it last longer and able to put with more force. Great over-all shin protection with high versatility which means you can also use this sleeve when you perform strength training exercises such as the deadlift, without having to worry about causing bleeding or bruising on your shins. Suitable for endurance training and long-distance running when you want to avoid cramps and lactic acid build up in your muscles. Increases your blood flow by keeping your legs warm and preventing your calf muscles from cooling down. For some athletes, the padding in the front might be slightly too thin, especially for tall players who tend to receive a lot of hits on their shin during games or practise. Several users have reported sizing issues with their regular size turning out to be too small. Thus, if you decide to go for this sleeve, try out in a store first or ask your retailer for a sizing recommendation based on your calf measurement. The Pro-Tec wrap was developed to reduce pain and discomfort associated with shin splints and in particular anterior shin splints. Anterior shin splints occur towards the outside of the leg, while other forms of shin splints may affect the inside of the shin. This is where the Pro-Tec wrap comes really handy since you can choose to wear the wrap either in an upper or lower position of the tibia (the shin bone). By providing slight pressure on the ligaments and muscles around the tibia, it prevents further tearing of these soft tissues, absorbs stress and reinforces your healing process. Contains a compression pad on the inside of the wrap that you can position over the muscle that you want to add additional support to. Beneficial design that makes it easy to change into and out of the wrap very quickly. You have find the wrap does not stay in place and slides down your legs. For this reason, keep alert on what size you should choose and if possible, ask to try out in a store so that you can get a feel for how well it stays on while you move or run. 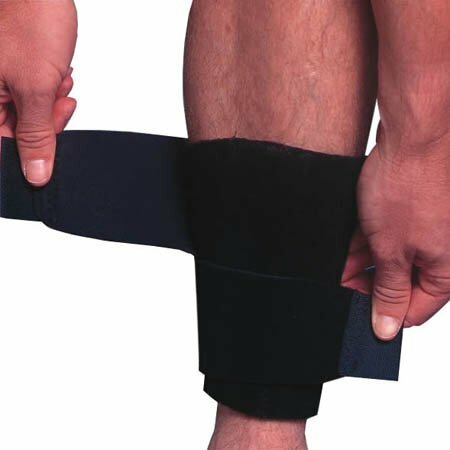 Recommended for athletes with mild to moderate pain from shin splints and calf strains, the Shock Doctor calf/shin wrap comes with integrated shin support pads that contributes with targeted healing pressure. The multi-strap system is adjustable which means that you can customize the level of compression you desire. The wrap is also equipped with spandex binding, making it more comfortable and higher in durability. Additionally, the N-tex vented moisture-wicking neoprene offers therapeutic warmth and improves blood circulation. High in protection yet still flexible, without feeling bulky. Decreases pain associated with high impacts movements such as sprints, jumps or walking on stairs or slopes. Strong Velcro straps aimed at preventing the wrap from sliding off. Only comes in one size which is supposed to fit any athlete. However, some users have still reported sizing issues with the wrap being too small and too tight. Although the Velcro straps might help with preventing the wrap from sliding off, they have a tendency to get tangled up after repeated usage. 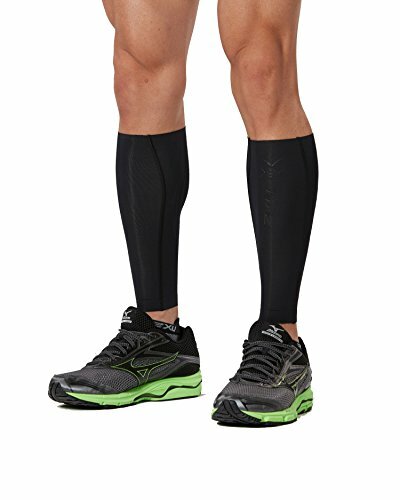 If you’re looking to provide your calf and shins more support without feeling restricted by bulky protection, then the 2XU Compression Calf Guards might just be the right fit for you. Made from flexible compression fabric, this product is both lightweight, high in breathability, and extremely comfortable. More importantly, it prevents shin splints and reduces fatigue in your lower legs by decreasing muscle oscillation, which is vibration of muscles caused by repetitive impact loading. As a bonus, they are are also antibacterial and equipped with Ultraviolet Protection Factor 50+ sun protection, protecting your lower legs from getting burned. 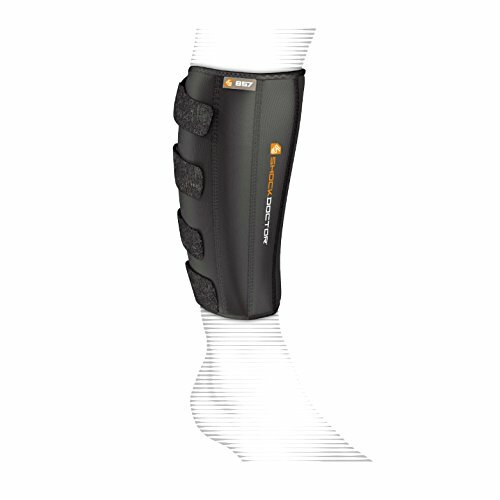 Suitable shin support for running and endurance activities. Anti-sweat fabric that keeps you dry and cool when needed. Problems with stitching tearing up. One way to prevent this might be to hand-wash the calf guards, rather than machine washing. This also helps to keep the logo intact, as it tends to wear off over time. List Somewhat short models which could be experienced as an issue if you have long legs. Designed with a combination of durable nylon/spandex and copper ions, this lightweight sleeve fits like a second skin while providing you with improved mobility and flexibility. The sleeve gives just the right amount of compression, helping you to quicker recovery while reducing pain and soreness associated with shin splints, tight calves, muscle cramps and varicose veins. Equipped with technology to keep your muscles warm when it’s cold and cool when it’s hot, there’s less risk for numbness and cramping. 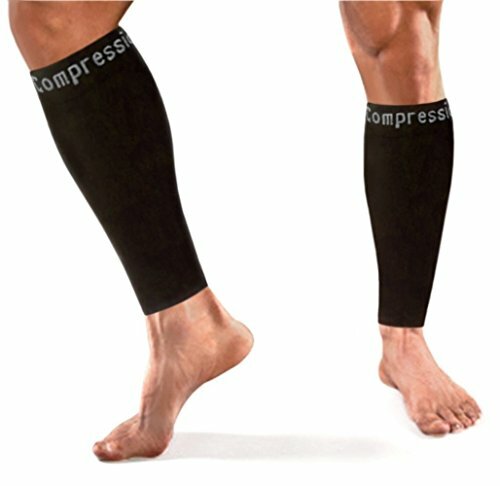 Ideal compression sleeve for running and basketball athletes. Accurate fitting that increases comfort and prevents the sleeve from slipping around. Plenty of quality for a very affordable price. For those athletes in need of heavy support, this model could feel slightly too thin and you might want to look for something with a thicker material. Stretchy and big in sizing, thus, consider to try a smaller model if you have slim calves. Made from durable, thin and breathable hypoallergenic material (free from neoprene and latex), BioSkin has aimed to create a sleeve that boosts performance and enhances your recovery during injury and after hard workouts. Providing medical-grade compression, it eases pain from shin splints and calf strains, increases circulation and helps your legs to stay fresh, even after long distance running. Word of advice, this sleeve is very compressive so be prepared to give it some time to break in. Enables you to continue your activity for a longer period of time by reducing fatigue. Suitable for long-distance hiking and walking/running downhill. High-quality sleeve that doesn’t roll over even if you use it on a daily basis. Lasts long even after repeated washing. If you have big calves, be sure that you get the size right since this sleeve has had a lot of complaints about being too tight. Somewhat tricky to remove once you’ve been wearing them for a long period of time and they tend to get stuck at your heel when you try to pull them off. Compared to the other compression sleeves and support braces that we have presented so far, SKINS stands out with a more distinct and bold look. If that doesn’t set you off, this is a very well-constructed product that prevents injury by offering support to the whole lower leg. Furthermore, it reduces lactic acid build-up and causes less muscle oscillation, which decreases the risk of triggering stress fractures. The material used is moisture wicking, keeping you comfortable and dry. Provides you with sufficient compression and warmth, without restricting your ability to move freely. High durability and maintains its tightness even after repeated usage. High in compression but slightly thin and lacks padding protection. As with any other sports equipment, you obviously want to make sure that you get as much value as possible for the money you invest. This means that you want to look for trustworthy labels that are associated with high-quality and have received good reviews from other users. In this article, that’s precisely what we have done for you. Whether you’re looking to add shin support for running, injury prevention, muscle soreness, stress fractures, or just want to enhance your performance, we’ve listed a variety of options. But first, let’s go through what features you need to consider before making a purchase. Regardless if you participate in a sport on amateur level, compete, or just like to exercise and be physically active, you want gear that you can count on and that can keep you protected for the long run. It should be able to withstand hard terrains, cold weather, extensive heat, and external force, without breaking up or decreasing in quality over time. By selecting a product made out of strong and resistant material, you’ll avoid having to worry about loosing compression or that the stitching will tear from washing. Besides from quality, fit and comfort are by far the most crucial attributes to look for when choosing your next compression sleeve, support brace or shin wrap. To get the right fit, make sure that you measure your calves so that you can select the optimal size for your legs. If possible, ask for advice in a sports store or by consulting with an online retailer. By doing so, you can get valuable feedback about how your needs might change during activity. For example, if you sweat a lot and your legs tend to swell when exposed to heat, you might want to consider getting a bigger size than you normally would. This also leads us to the importance of picking a sleeve with breathable fabric, so that you can stay cool, dry and focused on your performance. Although compression sleeves should never work as a supplement for proper injury rehabilitation or strength and stability training programs, they can provide you with that extra support which will allow you to feel more confident. For those individuals who have suffered from repeated shin splints or athletes who participate in highly physically demanding sports, protection might be the main priority. However, if you don’t have a history of injuries and merely want to boost your performance by increasing circulation and preventing cramps, a thinner and more lightweight compression sleeve could be enough. Again, it all comes down to your individual preferences and the using purpose. Shin Splints or MTSS are normally caused by extended overuse and overloading of your shinbone, also known as the tibia. The injury is characterized by pain and soreness on the front or inside of your lower leg. Usually, the pain is most severe right at the start of an activity before your body is warmed up. It then decreases during the activity, before returning once you cool down. If you’ve ever suffered from shin splints, chances are that it was triggered by excessive and high impact exercising such as running, or sports including repeated jumping and landing. These kind of movements are in the high risk zone for shin splints since they tend to result in fatiguing muscles and ligaments, especially if you don’t provide your body with sufficient recovery in between your training sessions. If you are hit by shin splints, the first thing you should do is to decrease the training volume, rest and temporarily switch over to activities that doesn’t put as much stress on tibia, such as swimming or bicycling. The rest may beneficially be combined with applying ice to cool down the damaged area, following the RICE protocol. Additionally, it’s important that you set aside time for both warm-up and stretching. Research shows that proper warm-up and stretching contribute to both physiological and physical benefits, including increased blood flow to your tissues, reduced risk of injury and improved flexibility . Ideally, stretching should take place within 15 minutes prior to the activity while the warm-up should last around 10 minutes with an intensity that produce mild sweating without fatigue, approximately 40-60% of your VO2max . For optimal results, these routines should be a long-term part of your exercise routine. If the injury still gets worse, we recommend that you consult with a physiotherapist that can help you with a tailored rehabilitation program. Regardless what sport or type of exercising you perform, working on improving and strengthening your muscles are crucial for injury prevention. Below, we have listed a few exercises that can help you to reduce the risk of shin splints. If you find this exercise challenging, you can adjust the difficult level by slightly bending your knees or by lifting your arms in a lateral position. With the sports equipment market blooming with endless of options, it can be difficult to find the right compression sleeve or support brace for you. For this reason, it’s essential that you first get a professional opinion on your shin splint diagnosis from a physiotherapist or strength coach. Once they have helped you to further identify your specific needs, this guide is good next step to get a grasp of what brands and models are available. With that said, remember that well-planned training, sufficient recovery and proper nutrition always beats equipment. If you want to perform at the best of your ability, these are all these factors that you need to take into consideration.